Mantle performed to sell out houses in April of 2012 at the Granary Theatre. It was Ronan FitzGibbon’s second script and the company’s first full production. Eight characters. Four stories. One room. An entire century. 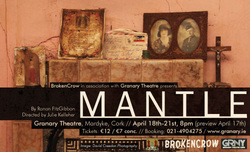 Mantle brings to life and examines moments of significance, both historical and personal, in the lives of its characters, all of whom have inhabited the same Cork City house which is the imagined setting for the play. Histories resonate and collide as the stories weave around each other on the stage, individual dramas come together with choir-like effect, allowing us a sweeping view of the lives lived within these walls over the course of a century. Cast includes: Tim Creed, Ger FitzGibbon, George Hanover, Bob Kelly, Charlie Kelly, Eadaoin O’Donoghue, Roisin O’Neill and Frank Prendergast.